"Railroad" and "Railway" redirect here. Rail transport is the conveyance of passengers and goods by means of wheeled vehicles specially designed to run along railways or railroads. It is a rapid, energy-efficient, but capital-intensive means of mechanized land transport. It is part of the logistics chain that facilitates international trade and economic growth in most countries. A railway system is a highly complex feat of engineering, with many hours of planning and forethought required for a successful outcome. Each system has two major types of components: those that move and those that are fixed. The components that move, called the rolling stock, include locomotives, passenger carrying vehicles (or coaches), and freight carrying vehicles (or goods wagons). The fixed components include the rail tracks (with their supporting structures) and ancillary buildings. BNSF Railway freight service in the United States. 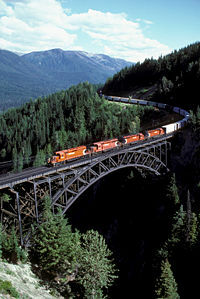 A long freight train crosses the Stoney Creek viaduct on the Canadian Pacific Railway in Southern British Columbia. Rail transport is considered one of the safest forms of travel. Nonetheless, there are various possibilities for accidents and breakdowns to occur. Trains are heavy, unable to deviate from the track, and require a great distance to stop. Accidents vary from derailments to head-on collisions with other trains or collisions with road vehicles at level crossings. 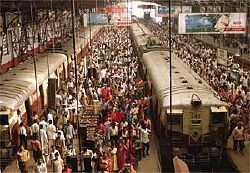 Chhatrapati Shivaji Terminus in Mumbai, India. 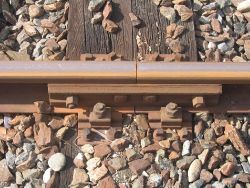 Typical rail tracks consist of two parallel rails, normally made of steel, secured to crossbeams, termed sleepers (UK and Australian usage) or ties (North American usage). The sleepers maintain a constant distance between the two rails; a measure known as the "gauge" of the track. 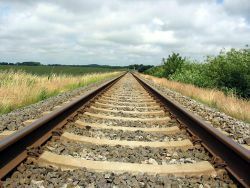 To maintain the alignment of the track, it is either laid on a bed of ballast or secured to a solid concrete foundation. The whole structure is referred to as the permanent way (UK and Australia) or right-of-way (North America). Railway rolling stock, which is fitted with metal wheels, moves with low frictional resistance when compared to road vehicles. However, locomotives and powered cars normally rely on the point of contact of the wheel with the rail for traction and adhesion (the part of the transmitted axle load that makes the wheel "adhere" to the smooth rail). While this is usually sufficient under normal dry rail conditions, adhesion can be reduced or even lost through the presence of unwanted material on the rail surface, such as moisture, grease, ice, or dead leaves. Along with various engineered components, rails constitute a large part of the permanent way. They provide smooth and hard surfaces on which the wheels of the train can roll with a minimum of friction. For example, a typical modern wagon can hold up to 125 tons of freight on two four-wheel bogies/trucks (100 tons in UK). The contact area between each wheel and the rail is tiny, a strip no more than a few millimeters wide, which minimizes friction. In addition, the track distributes the weight of the train evenly, allowing significantly greater loads per axle / wheel than in road transport, leading to less wear and tear on the permanent way. This can save energy compared with other forms of transportation, such as road transport, which depends on the friction between rubber tires and the road. Trains also have a small frontal area in relation to the load they are carrying, which cuts down on forward air resistance and thus energy usage, although this does not necessarily reduce the effects of side winds. 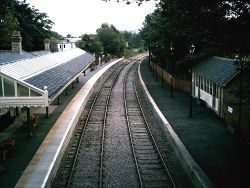 Railway tracks running through Stanhope railway station in North East England, UK. The vehicles traveling on the rails, collectively known as rolling stock, are arranged in a linked series of vehicles called a train, which can include a locomotive if the vehicles are not individually powered. A locomotive (or "engine") is a powered vehicle used to haul a train of unpowered vehicles. In the USA, individual unpowered vehicles are known generically as cars. These may be passenger carrying or used for freight purposes. For passenger-carrying vehicles, the term carriage or coach is used, while a freight-carrying vehicle is known as a freight car in the United States and a wagon or truck in Great Britain. An individually-powered passenger vehicle is known as a railcar or a power car; when one or more as these are coupled to one or more unpowered trailer cars as an inseparable unit, this is called a railcar set or multiple unit. Trackwork including a point on the Haytor Granite Tramway. The earliest evidence of a railway found thus far was the 6-kilometer (3.7 mi) Diolkos wagonway, which transported boats across the Corinth isthmus in Greece during the sixth century B.C.E. Trucks pushed by slaves ran in grooves in limestone, which provided the track element, preventing the wagons from leaving the intended route. The Diolkos ran for over 1300 years, until 900 C.E. The first horse-drawn wagon ways also appeared in ancient Greece, with others to be found on Malta and various parts of the Roman Empire, using cut-stone tracks. 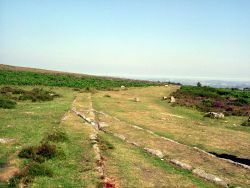 An example of stone track still exists on Dartmoor, England, where the Haytor Granite Tramway was built in 1820 using grooved granite blocks. Railways began reappearing in Europe after the Dark Ages following the collapse of the Roman Empire. The earliest known record of a railway in Europe from this period is a stained-glass window in the Minster of Freiburg im Breisgau dating from around 1350. By 1550, narrow gauge railways operating with wooden rails were common in mines in Europe. The first railways in Great Britain (also known as wagonways) were constructed in the early seventeenth century, mainly for transporting coal from mines to canal wharfs where it could be transferred to a boat for onward shipment. The earliest recorded examples are the Wollaton Wagonway in Nottinghamshire and the Bourtreehill - Broomlands Wagonway in Irvine, Ayrshire. Other examples can be found in Broseley in Shropshire, where wooden rails and flanged wheels were utilized, as on a modern railway. However, the rails were prone to wear out under the pressure, and had to be replaced regularly. In 1768, the Coalbrookdale Iron Works laid cast iron plates on top of the wooden rails, providing a more durable load-bearing surface. These were later used by Benjamin Outram at his foundry in Ripley, Derbyshire, the first time standardized components were produced. It was these that led to the name "platelayer" for workers on the permanent way. The advantage was that a considerable variation in wheel spacing (gauge) could be accommodated. However, wheels would bind against the upright part of the plate, and mud and stones would accumulate. On the Little Eaton Gangway in 1799, where Outram used passing loops on the single track, moveable plates were provided, called "pointers," which became shortened to "points". From the late eighteenth century, iron "edge rails" began to appear. The British civil engineer William Jessop designed smooth iron edge rails, which were used in conjunction with flanged iron wheels, introducing them on a route between Loughborough and Nanpantan, Leicestershire, as an adjunct to the Charnwood Forest Canal, in 1793-1794. In 1803, Jessop opened the Surrey Iron Railway in south London, arguably the world's first horse-drawn public railway. Being of cast iron these rails were short, around three feet long, of a "fish-bellied" design. They had a foot at each end by means of which they were fastened to stone blocks in the ground. Cast iron is a brittle material and the short lengths meant that they soon became uneven. However, developments in the process of hot rolling iron meant that longer length rails could be produced. In 1805, the first wrought iron rails were produced at Bedlington Ironworks near Durham. 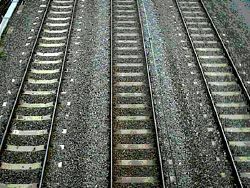 The first steel rails were produced by Robert Forester Mushet and laid at Derby station in 1857, Modern railways still use steel rails, but they are typically welded together to form lengths of continuous welded rail which removes the additional wear and tear on rolling stock caused by the tiny differences in rail surface height at the joint between adjacent rail sections. 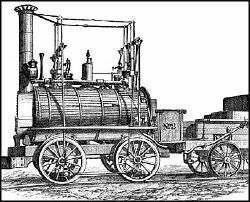 Blücher, an early railway locomotive built in 1814 by George Stephenson. In 1811, John Blenkinsop designed the first successful and practical railway locomotive. He patented a system of moving coals by a rack railway worked by a steam locomotive (patent no. 3431), and a line was built connecting the Middleton Colliery to Leeds. The locomotive (The Salamanca) was built in 1812 by Matthew Murray of Fenton, Murray and Wood. The Middleton Railway was the first railway to successfully use steam locomotives on a commercial basis. It was also the first railway in Great Britain to be built under the terms laid out in an Act of Parliament. Blenkinsop's engine had double-acting cylinders and, unlike the Trevithick pattern, no flywheel. Due to previous experience with broken rails, the locomotive was made very light and this brought concerns about insufficient adhesion, so instead of driving the wheels directly, the cylinders drove a cogwheel through spur gears, the cogwheel providing traction by engaging with a rack cast into the side of the rail. 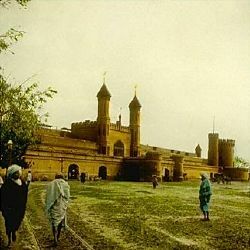 Magic lantern image of Lahore Railway Station, Lahore circa 1895. Density of the European railway net in 1896. In Scotland, the Kilmarnock and Troon Railway was the first railway constructed, and was authorized by Act of Parliament in 1808. The civil engineer leading the project was William Jessop, and its 1811 construction meant that it was the first railway in Scotland to use a steam locomotive, while it was the only line in Scotland for 14 years. Its representation appeared in the Coat of Arms of the Burgh of Troon. The line was intended to carry coal for the Duke of Portland; and ran services between Kilmarnock and Troon Harbour. The line began life as a 9.5 mile (16 km), double track 4 ft 0 in (1,219 mm) gauge, horse-drawn wagonway. It was built using cast iron plate rails with an inner flange. A George Stephenson-built locomotive, his second one from Killingworth Colliery, was tried on the main line in 1817, but the weight of the engine broke the cast iron plate rails. It worked better when wooden rails were used, and the locomotive remained in use until 1848. The Stockton and Darlington Railway opened in northern England in 1825 to be followed five years later by the Liverpool and Manchester Railway, considered to be the world's first "Inter City" line. The rail gauge (the distance between the two rails of the track) was used for the early wagonways, and had been adopted for the Stockton and Darlington Railway. The 4 ft 8½ in (1,435 mm) width became known as the international "standard gauge," used by about 60 percent of the world's railways. The Liverpool and Manchester Railway, on the other hand, proved the viability of rail transport when, after organizing the Rainhill Trials of 1829, Stephenson's Rocket successfully hauled a load of 13 tons at an average speed of 12 miles per hour. The company took the step of working its trains from its opening entirely by steam traction. Railways then soon spread throughout the United Kingdom and the world, and became the dominant means of land transport for nearly a century, until the invention of aircraft and automobiles, which prompted a gradual decline in railways. The first railroad in the United States may have been a gravity railroad in Lewiston, New York in 1764. The 1809 Leiper Railroad in Pennsylvania was intended as the first permanent railroad, and the 1826 Granite Railway in Massachusetts was the first commercial railroad to evolve through continuous operations into a common carrier. The Baltimore and Ohio, opened in 1830, was the first to evolve into a major system. In 1867, the first elevated railroad was built in New York. In 1869, the symbolically important transcontinental railroad was completed in the United States with the driving of a golden spike at Promontory, Utah. The development of the railroad in the United States helped reduce transportation time and cost, which allowed migration towards the west. Railroads increased the accessibility of goods to consumers, thus allowing individuals and capital to flow westward. Railroads created national markets characterized by the 'law of one price' by lowering difference in price charged for commodity between suppliers and demanders. Railroads increased social savings, and were the largest contributors of any innovation before 1900. The South American experience regarding railways was first achieved in 1854, when a line was laid between the Chilean towns of Caldera and Copiapo. However, the first concerted trans-Andine attempt between Argentina and Chile did not occur until the 1870s, due to the financial risks involved in such a project. It was not until 1887 that the Argentineans began to construct their part of the enterprise, with the Chileans beginning construction in 1889, though by 1893, work had ceased due to financial constraints. In 1896, the Transandine Railway Company was created in London to purchase the existing railways and construct a continuous line between Argentina and Chile that would improve transport and communication links in South America. This was finally completed in 1908, when the Argentine and Chilean stretches of track were joined. 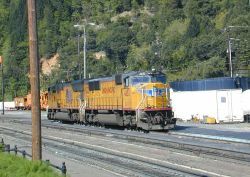 Two SD70M diesel locomotives of the Union Pacific refueling at Dunsmuir, California. Dieselization was the replacement of the steam locomotive with the diesel-electric locomotive (often referred to as a "diesel locomotive"), a process which began in the 1930s and is now substantially complete worldwide. Dieselization took place largely because of the reduction in operating costs it allowed. Steam locomotives require large pools of labor to clean, load, maintain and run. They also require extensive service, coaling and watering facilities. 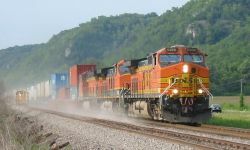 Diesel locomotives require significantly less time and labor to operate and maintain. After World War II, dramatically increased labor costs in the Western World made steam an increasingly costly form of motive power. At the same time, the war had forced improvements in internal combustion engine technology that made diesel locomotives cheaper and more powerful. The post war world also re-aligned the business and financial markets, as did world geo-politics as in the Cold War (1947-1953). 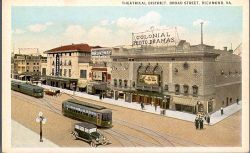 Postcard showing electric streetcars in Richmond, Virginia, where Frank J. Sprague successfully demonstrated his new system on the hills in 1888. Robert Davidson started to experiment with an electrical railway car in Scotland in 1838. By 1839 he had completed and presented a 4.8 m long carriage that weighed six tons, including batteries. It reached a maximum speed of 6.4 kilometers per hour. Sweden got the perhaps first fully electrified developed railway that efficiently transported commuters as well as goods, in 1895. At the time it ran from close to central Stockholm to Rimbo, located in the countryside Roslagen. It is still in use to commuters today but runs only about a third of its biggest extent, much due to it not using the standard gauge but 3ft (891mm). In the USSR, children's railways were developed in the 1930s. (The world's first one was opened on July 24, 1935.) Fully operated by children, they were extracurricular educational institutions where teenagers learned railway professions. Many of them are functioning in post-Soviet states and Eastern European countries. 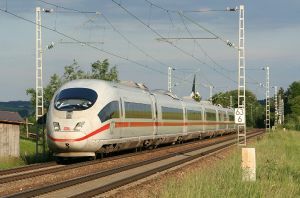 Many countries since the 1960s have adopted high-speed railways. On April 3, 2007, the French TGV set a new train speed record. The train, with a modified engine and wheels, reached 574.8 km/h (357.2 mph). The record attempt took place on the new LGV Est line between Paris and Strasbourg using a specially equipped TGV Duplex train. The overhead lines had also been modified for the attempt to carry 31,000 V rather than the line's normal 25,000 V. On August 24, 2005, the Qingzang railway became the highest railway line in the world, when track was laid through the Tanggula Mountain Pass at 5,072 meters (16,640.4 ft) above sea level in the Tanggula Mountains, Tibet. 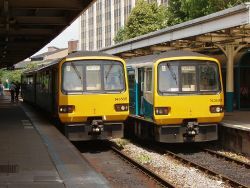 Two British Rail Class 143 DMUs at Cardiff Queen Street station in the United Kingdom. A locomotive is the vehicle that provides the motive power for a train. A locomotive has no payload capacity of its own, and its sole purpose is to move the train along the tracks. Traditionally, locomotives pull trains from the front. A railroad car is a vehicle used for the haulage of either passengers or freight. Most cars carry a "revenue" load, although "non-revenue" cars are run for the railroad's own use, such as for maintenance-of-way purposes. 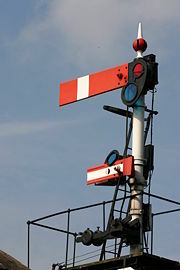 Railway signaling is a system used to control railway traffic safely to prevent trains from colliding. Being guided by fixed rails, trains are uniquely susceptible to collision since they frequently operate at speeds that do not enable them to stop quickly or, in some cases, within the driver's sighting distance. Most forms of train control involve movement authority being passed from those responsible for each section of a rail network (e.g., a signalman or stationmaster) to the train crew. The set of rules and the physical equipment used to accomplish this control determine what is known as the method of working (UK), method of operation (US) or safeworking (Aus.). Not all methods require the use of signals, and some systems are specific to single track railways. The signaling process is traditionally carried out in a signal box or interlocking tower, a small building that houses the lever frames required for the signalman to operate switches and signal equipment. These are placed at various intervals along the route of a railway, controlling specified sections of track. More recent technological developments have made such operational doctrine superfluous, with the centralization of signaling operations to regional control rooms. This has been facilitated by the increased use of computers, allowing vast sections of track to be monitored from a single location. Railway tracks are laid upon land owned or leased by the railway. Owing to the requirements for large radius turns and modest grades, rails will often be laid in circuitous routes. Public carrier railways are typically granted limited rights of eminent domain (UK:compulsory purchase). In many cases in the nineteenth century, railways were given additional incentives in the form of grants of public land. Route length and grade requirements can be reduced by the use of alternating earthen cut and fill, bridges, and tunnels, all of which can greatly increase the capital expenditures required to develop a right of way, while significantly reducing operating costs and allowing higher speeds on longer radius curves. In densely urbanized areas such as Manhattan, railways are sometimes laid out in tunnels to minimize the effects on existing properties. 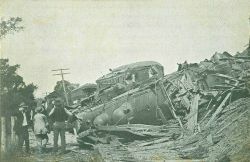 Train wreck, 1907, in Canaan, New Hampshire. Trains can travel at very high speeds. However, they are heavy, unable to deviate from the track, and require a great distance to stop. Although rail transport is considered one of the safest forms of travel, there are many possibilities for accidents to take place. These can vary from the minor derailment (jumping the track) to a head-on collision with another train or collision with an automobile or other vehicle at a level crossing/grade crossing. The most important safety measures are railway signaling and gates at level/grade crossings. Train whistles warn of the presence of a train, while trackside signals maintain the distances between trains. In the United Kingdom, vandalism and negligence are thought responsible for many rail accidents. Railway lines are zoned or divided into blocks guarded by combinations of block signals, operating rules, and automatic-control devices so that one train, at most, may be in a block at any time. Compared with road travel, railways remain relatively safe. Bolted rail connection and tie-down. Also known as a fishplate. As noted earlier, a typical railroad track consists of two parallel steel (or, in older networks, iron) rails, generally anchored perpendicular to beams (sleepers or ties) of timber, concrete, or steel to maintain a constant distance (gauge). The rails and perpendicular beams are usually then placed on a foundation made of concrete or compressed earth and gravel in a bed of ballast to prevent the track from buckling (bending out of its original configuration) as the ground settles over time under the weight of the vehicles passing above. Trackage, consisting of the ties and rails, may be prefabricated or assembled in place. Rails are usually composed of segments welded or bolted together. The length of each segment may be comparable to that of a railcar or two, or it may be hundreds of feet long. The surface of the ballast is sloped around curves to reduce lateral forces. This is called superelevation or cant. This reduces the forces tending to displace the track and makes for a more comfortable ride for passengers and livestock. This is effective over a limited range of speeds, however. The first component of a railway is the route, which is planned to provide the least resistance in terms of gradient and engineering works. As such, the track bed is heavily engineered to provide, where possible, a level surface. As such, embankments are constructed to support the track and to provide a compromise in terms of the route's average elevation. 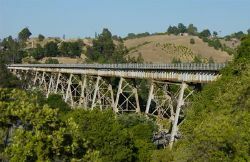 With this in mind, various structures such as bridges and viaducts are constructed in an attempt to maintain the railway's elevation, and gradients are kept within manageable limits. In hilly terrain, to avoid a long detour, a tunnel may be bored through the hill. Once these engineering works needed for the route are completed, a bed of stone (ballast) is laid over the compacted track bed to enhance drainage around the ties and evenly distribute pressure over a wider area, locking the track-work in place. Crushed stone is firmly tamped to prevent further settling and to lock the stones. Minor water courses are channeled through pipes (culverts) before the grade is raised. The base of the trackage consists of treated wood, concrete, or steel ties. Traditional US practice with wood sleepers is to anchor the rail structure to the road bed through the use of baseplates. These are attached to the top of the ties to provide a secure housing for the flat bottomed rails. After placement of the rail atop the plate, spikes are driven through holes in the plate and into the tie where they are held by friction. The top of the spike has a head that clamps the rail. As an alternative, lag bolts can be used to retain the clamps, which is preferred since screws are less likely to loosen. Traditional practice in the UK was to screw cast iron 'chairs' to wooden sleepers. These chairs loosely hold bullhead rail which is then secured by a wood or steel 'key' wedged between the side of the rail and the chair. With concrete or steel sleepers, fixings are built into the sleeper to which flat bottom rail is attached with sprung steel clips. The space between and surrounding the ties is filled with additional ballast to stabilize the rail assembly. Points (UK) or switches (US), technically known as turnouts, are the means of directing a train onto a diverging section of track, for example, a siding, a branch line, or a parallel running line. 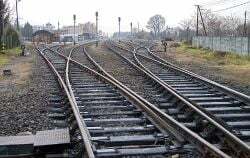 Laid similar to normal track, a point typically consists of a frog (common crossing), check rails and two switch rails. The switch rails may be moved left or right, under the control of the signaling system, to determine which path the train will follow. Spikes in wooden ties can loosen over time, while split and rotten ties may be individually replaced with a concrete substitute. Should the rails settle due to soil subsidence, they can be lifted by specialized machinery and additional ballast tamped down to form a level bed. Periodically, ballast must be removed and replaced with clean ballast to ensure adequate drainage, especially if wooden ties are used. Culverts and other passages for water must be kept clear lest water is impounded by the trackbed, causing landslips. Where trackbeds are placed along rivers, additional protection is usually placed to prevent erosion during times of high water. Bridges are another important component requiring inspection and maintenance. In the United Kingdom and most other members of the Commonwealth of Nations, the term railway is used in preference to the United States term, railroad. In Canada, railway and railroad are used interchangeably, although in law railway is the usual term. Railroad was used in the United Kingdom concurrently with railway until the 1850s, when railway became the established term. Several American companies have railway in their names instead of railroad, the BNSF Railway being the pre-eminent modern example. In the United Kingdom, the term railway often refers to the whole organization of tracks, trains, stations, signaling, timetables, and the operating companies that collectively make up a coordinated railway system, while permanent way or p/way refers to the tracks alone. However this terminology is generally not commonplace outside of the industry or those who take a keen interest in it. Subways, metros, elevated lines, trolley lines, and undergrounds are all specialized forms of rail transportation. ↑ Ridership Report American Public Transportation Association. Retrieved August 30, 2018. ↑ Stuart Hylton, The Grand Experiment: The Birth of the Railway Age 1820-1845 (Hersham, UK: Ian Allan Publishing, 2007, ISBN 978-0711031722). ↑ Georgius Agricola, Herbert Clark Hoover, Lou Henry Hoover (trans. ), "De re metallica." London, UK: The Mining Magazine, 1912. ↑ A. Vaughan, Railwaymen, Politics and Money (London, UK: John Murray, 1997, ISBN 978-0719551505). ↑ 5.0 5.1 John Marshall, The Guinness Book of Rail Facts & Feats (Enfield, UK: Guinness Superlatives, 1979, ISBN 0900424567). ↑ The Surrey Iron Railway - 1803 Stephenson Locomotive Society. Retrieved August 30, 2018. ↑ J. Chartres, Richard Trevithick, in John Cannon, (ed.) Oxford Companion to British History (Oxford, UK: Oxford University Press, 1997, ISBN 978-0198661764), 932. ↑ A Brief History Of The Railway The Swansea & Mumbles Railway. Retrieved August 30, 2018. ↑ Hamilton Ellis, The Pictorial Encyclopedia of Railways (London, UK: The Hamlyn Publishing Group, 1968), 20. ↑ Stockton and Darlington Railway Spartacus Educational. Retrieved August 30, 2018. ↑ Liverpool and Manchester Railway Spartacus Educational. Retrieved August 30, 2018. ↑ Greg Harrison, The Leiper Railroad AbandonedRails. Retrieved August 30, 2018. ↑ Stephen E. Ambrose, Nothing Like It In The World; The men who built the Transcontinental Railroad 1863-1869 (New York, NY: Simon & Schuster, 2000, ISBN 0684846098). ↑ Ariane Bernard, French TGV Sets Record, Reaching 357 Miles an Hour The New York Times, April 3, 2007. Retrieved August 30, 2018. ↑ Qinghai Tibet Railway Tibet Vista. Retrieved August 30, 2018. ↑ Bart Jansen, Trains safer than cars, buses for passengers, experts say USA Today, April 4, 2016. Retrieved August 30, 2018. Ambrose, Stephen E. Nothing Like It In The World; The men who built the Transcontinental Railroad 1863-1869. New York, NY: Simon & Schuster, 2000. ISBN 0684846098. Armstrong, John H. Railroad: What It Is, What It Does, 4th Ed. Omaha, NE: Simmons-Boardman Books, 1998. ISBN 978-0911382044. Cannon, John (ed.) Oxford Companion to British History. Oxford, UK: Oxford University Press, 1997. ISBN 978-0198661764. Ellis, Hamilton. The Pictorial Encyclopedia of Railways. London, UK: The Hamlyn Publishing Group, 1968. Ely, James W. Jr. Railroads & American Law. Lawrence, KS: University Press of Kansas, 2002. ISBN 978-0700611447. Fremdling, Rainer. Railways and German Economic Growth: A Leading Sector Analysis with a Comparison to the United States and Great Britain. The Journal of Economic History. 37(3) (1977):583-604. Guy, A. and J. Rees (eds.). Early Railways. A Selection of Papers from the First International Early Railways Conference. London, UK: Newcomen Society, 2001. ISBN 978-0904685084. Hylton, Stuart. The Grand Experiment: The Birth of the Railway Age 1820-1845. Hersham, UK: Ian Allan Publishing, 2007. ISBN 978-0711031722. Jenks, Leland H. Railroads as an Economic Force in American Development. The Journal of Economic History. 4(1) (1944): 1-20. Marshall, John. The Guinness Book of Rail Facts & Feats. Enfield, UK: Guinness Superlatives, 1979. ISBN 0900424567. Nock, O.S. (ed.). Encyclopedia of Railways. London, UK: Octopus Books, 1977. ISBN 978-0706406047. O’Brien, Patrick. Railways and the Economic Development of Western Europe, 1830-1914. New York, NY: St. Martin's Press, 1983. ISBN 978-0312662776. Simmons, Jack and Gordon Biddle (eds.). The Oxford Companion to British Railway History: From 1603 to the 1990s. New York, NY: Oxford University Press, 1999. ISBN 978-0198662389. Skelton, Oscar D. The Railway Builders. Toronto, CA: Glasgow, Brook, & Company, Toronto, 1916. Stover, John. American Railroads. Chicago, IL: University of Chicago Press, 1997. ISBN 978-0226776583. Vaughan, A. Railwaymen, Politics and Money. London, UK: John Murray, 1997. ISBN 978-0719551505. This page was last modified on 30 August 2018, at 19:30.